After fourteen long months since I wrote a report on insects and spiders of Kanha in August, a few of us (myself, Malay and Ankita of Resurrect, and Kedar Gore of The Corbett Foundation) got together to discuss on turning this into something much more than just a report, and we came up with a field guide – a handy book on common insects and spiders of Kanha Tiger Reserve. 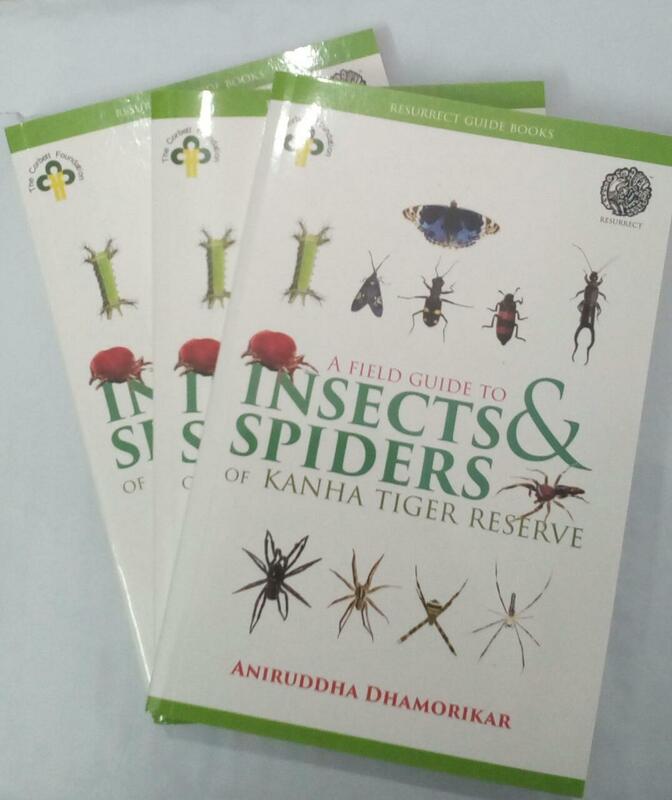 Field Guide to Insects and Spiders of Kanha Tiger Reserve, now in stores. 1. It is a subject-specific book, but is not exhaustive. It covers 10 most common Orders of insects – from Lepidoptera (butterflies and moths) to Neuroptera (lacewings), in detail, and 11 other insect Orders in the passing (such as mayflies and webspinners), with general notes on their behaviour, lifecycle, and ecology accompanied by photographs of some common and not-so-uncommon specimens (469 in total), along with brief descriptions of their behaviour or characters wherever it was possible to observe. Since spiders come in a single Order (Araneae), focus has been on families – this book covers 24 families of spiders (114 specimens) you are bound to come across on your wanderings. Apart from this, it has mentions of 9 non-insect arthropods and 9 non-spider arachnids. 2. It is a region-specific book, but it is expandable. Although the book’s focus is on the 2000 odd square kilometres of Kanha – describing its ecosystem and how insects and spiders occupy it, it can also be used in other parts of central India – specifically those which also cover the sal and mixed deciduous and grassland-kind of ecosystems. It also showcases a study which can be replicated in other areas, such as the unique Satpuda Tiger Reserve up north-west and Pench down south-west. 3. It has one section entirely on how to visually identify some common orders of insects from just looking at them or by taking a photograph – and is aimed for the novice. It covers 12 sketch-plates to help take the first step in identifying an insect – for example, if you’re confused between a butterfly and a moth, or a beetle and a bug, or a dragonfly and an owlfly, or with respect to spiders – between a jumping spider and a wolf spider, an orb weaver and a giant wood; you can refer to this section. 4. 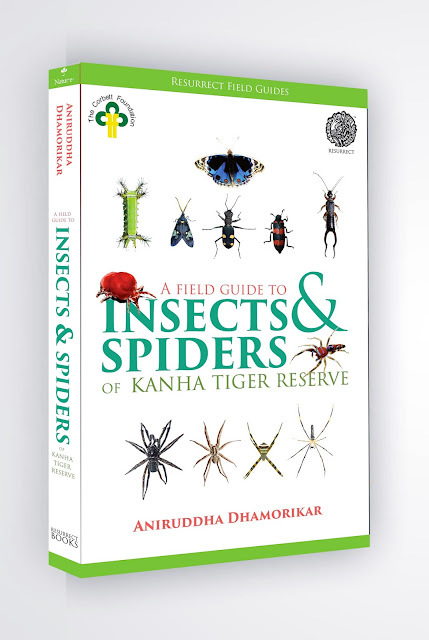 It also focuses on some scientific technicalities of insects and spiders – more particularly their density and diversity, how they form their own communities – and why – and what role they play in Kanha’s ecosystem, and a ‘fun facts’ section on insects and spiders and their cool tricks. 5. Finally, and again, it covers images which will aid in identification of 600 species of these invertebrates in Kanha. This book, with a foreword by Shri J S Chauhan (IFS), then the Field Director of Kanha Tiger Reserve under whom many revolutionary projects of wildlife conservation were undertaken, was released at the hands of Shri Jitendra Agrawal (IFS), the Principal Chief Conservator of Forests (Wildlife) of the Madhya Pradesh Forest Department, and Shri Rajnish Singh, Assist. Conservator of Forests, in presence of the publishers, Resurrect Books (India), and the director Shri Kedar Gore and deputy director Dr Sharad Kumar of The Corbett Foundation. If you’re keen on purchasing it, you can do it online, and if you’re visiting Kanha in the next few weeks, it will be made available at the souvenir shop at Mukki and Kisli as well. And if you do make a purchase, do write to me about what you like about the book and what you do not. I consider this one as a work-in-progress – there is so much to learn, and it barely scratches the surface of the biodiversity of Kanha, but, as a beginning, I hope it serves its purpose in introducing you to the fascinating world of insects and spiders (in a central Indian context).